Use the 150Wh silver HyperJuice 1.5 External Battery from Sanho to keep your MacBook, MacBook Pro, MacBook Air, iPad, iPhone or USB-powered devices charged and ready to go. This rechargeable external battery has a protective aluminum casing that ensures it's built to last. Please note! Apple MagSafe Airline Adapter is sold separately by Apple (not included with purchase). The Apple MagSafe Airline Adapter or Magic Box is required in order to use this product with your MacBook. 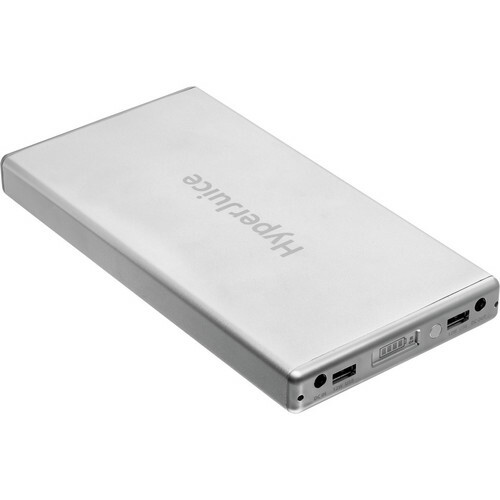 Box Dimensions (LxWxH) 13.3 x 10.7 x 2.7"
HyperJuice 1.5 External Battery (150Wh, Silver) is rated 2.5 out of 5 by 2. Rated 1 out of 5 by Renam Christofoletti from Product doesnt work First time I used the external battery it worked perfectly for 15 minutes, and then suddenly die. I have to plug on AC to turn it on again every time. Big deffct. Rated 4 out of 5 by Anonymous from 4th Battery by Hyperjuice and still happy! This is my 4th External Battery by Hyperjuice. I continue to support them because their batteries plain and simply have been bullet proof for me. I am a commercial photography digital tech and abuse these batteries. The previous batteries by Hyper Juice lasted YEARS. I would give 5 stars except for the irritating Magic Box Modification. I would rather they bundled this with the battery (even if it means more money). Hopefully this won't be an issue with USB -C.